This recipe was shared with me years ago by a friend. This is one of those recipes I long for in the summer. A way to use up those cucumbers and share are your get togethers. This is a crowd pleaser for sure. I recently shared this in my food column in the July issue of Chesapeake Style Magazine. For those of you who do not know, I write a monthly food column in this local magazine. I took a photography class with the editor and was asked if I would be interested in doing a column. The teacher for the class has been a great supporter of my blog and asked me to make the Warm Lemon Pudding Cake for after lunch. Needless to say I think this recipe was hard to forget. A couple issues later and I am now living a little of my dream as a writer. You have no idea the pride I feel every time I see my name in print on something I wrote. Please do check out the magazine. The issues are available online at www.Chesapeakestyle.com. I do hope you go and check it out. Mix cucumbers, onion, green pepper, and salt. Cover with cold water and refrigerate overnight. Drain next morning; add the vinegar, sugar and celery seed. Cover and refrigerate until ready to serve. This mixture will make its own liquid. Nice recipe for summers!!!! Sounds so cool and yummy. TWO cups of sugar??!! Is this correct? Thanks. Hey there, yes the 2 cups is correct. This makes a big batch. You can certainly cut back on the sugar if you want to lessen it some. Hope you get to try it. 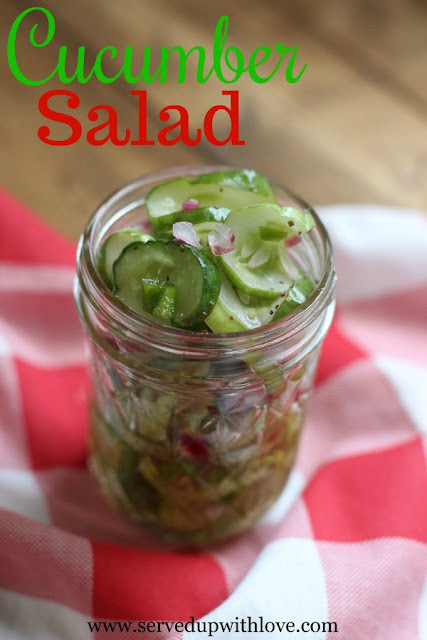 My mom always made the best cucumber salad and mine never was as good as hers. I asked her one day what she does that I am not doing and she said the key is lots of sugar. Now mine is a good as mom's. This recipe is like we use, it is so good on a warm summer day. I could just eat it for my meal. Yes, I agree, the sugar makes all the difference. I could eat this all day long and be happy! Thanks to ALL of you for this confirmation & comments gift to me. I just now found it. How can you print this recipe...I don't see a Print option . If you look to the left, that bottom green button is a print friendly button. I would say at least 8 -10 servings. 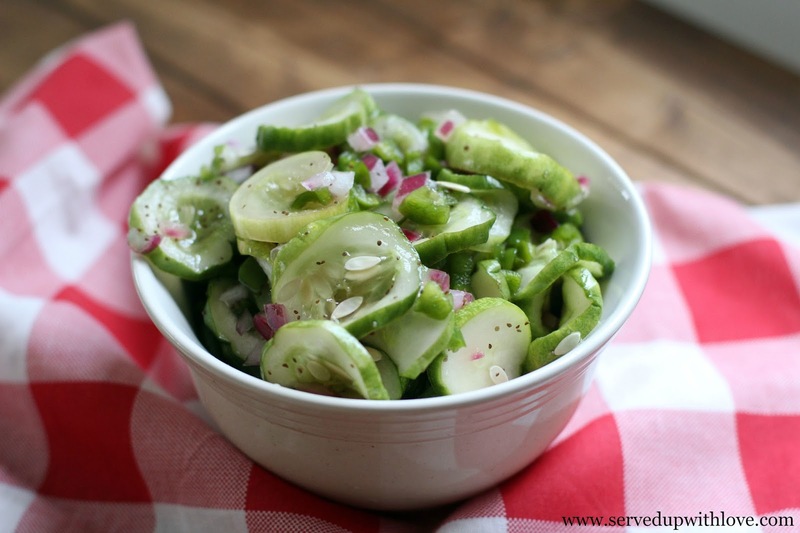 It is a great side dish for any gathering or to eat on for a few days. Hope you get to try it out soon.